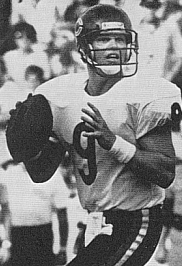 Following a record-setting career at BYU, where he operated in a pro style offense, McMahon was chosen by the Bears in the first round of the 1982 NFL draft (fifth overall) – the first QB taken by Chicago in the top round in over 30 years. While there were concerns regarding a knee injury and limited eyesight, as well as lack of ideal height, McMahon had also demonstrated outstanding leadership skills. Following the 57-day player strike in 1982, he was inserted into the starting lineup. Bears went 3-6 to finish 12th in the NFC, with the divisions having been discarded due to the players’ strike. Well known for his outlandish behavior as for skill on the field during seven years in Chicago, McMahon improved upon his promising rookie year, along with the team. The Bears went to the playoffs in 1984 and won the Super Bowl in ’85, a season in which McMahon was also chosen for the Pro Bowl. However, injuries were a constant issue. A smart, if quirky, quarterback who was adept at exploiting weaknesses in enemy defenses, the team went 46-15 in the regular season with McMahon behind center – but he missed a third of Chicago’s games along the way due to a series of maladies. Forced to sit out ever more time due to injury, and constantly feuding with Head Coach Mike Ditka, McMahon was dealt to San Diego in 1989 and moved on to a backup role with Philadelphia in ’90. He played well in relief of the injured Randall Cunningham in 1991, but again missed significant time due to his own injuries. He moved on to Minnesota for 1993, his last year as a full-time starter, and following a season in Arizona, ended up as Brett Favre’s backup in Green Bay for his last two years (1995-96). Overall, McMahon completed 58 percent of his passes for 18,148 yards with 100 TDs and his overall record as a starting QB was 67-30.